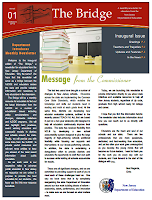 NJ DOE introduces "The Bridge"
The New Jersey Department of Education is reaching out to educators through a new newsletter entitled “The Bridge”. Visit the New Jersey Educator Spotlight page to subscribe or view the January and February issues. The Bridge will be a monthly resource for educators to find out the latest information from the NJDOE on a number of educational issues including policy considerations and changes, statewide initiatives and NJDOE programs. We will also highlight best practices, award winning educators and successful models in districts and schools around the state. Finally, we will provide you with some links from the NJDOE to provide useful resources and relevant news articles to keep you abreast of the most recent information about public education.